Two Bears Farm and the Three Cubs: It's Not Valentine's without Cookies! 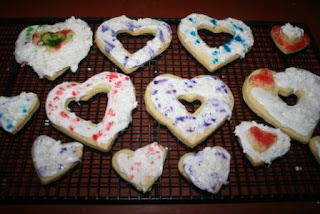 It's Not Valentine's without Cookies! Valentine's Day is one of those holidays like Christmas. It just begs to make cookies. 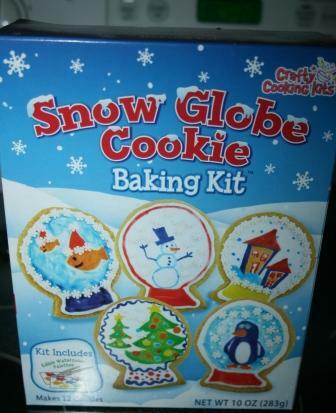 My Mom got us this Snow Globe cookie baking kit on Christmas clearance. We decided to repurpose it for Valentine's cookies. I saved the cookie cutter for future snow globe and/or fortune teller ball cookies. 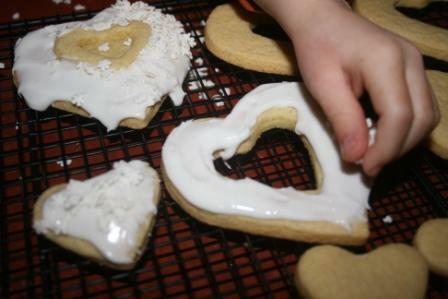 We discovered four heart cookie cutters in my cookie cutter stash. Not sure why I had so many. After rolling, cutter, and cooking the cookies, we made the frosting and iced them. Pierce handled the snowflake sprinkles. Snowflake sprinkles can double as heart lace, you see. 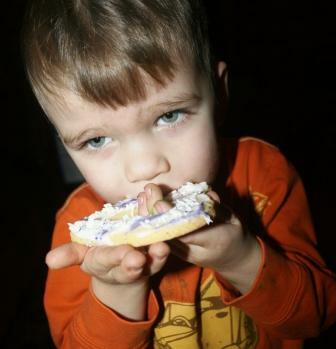 For the first time, I think he got more sprinkles on cookies than in his mouth. 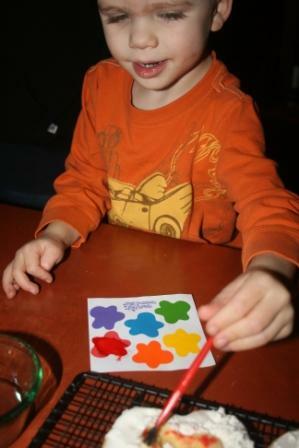 Next for Pierce's favorite part - painting the cookies. He loves these edible paints that come in the cookie kits. I would love to have taste tested one. So cute! I love the little helpers :) Looking forward to when my babe is old enough to help and have fun in the kitchen with me. they do look yummy and it looks like fun! we make my grama's rice-krispy bar recipe, add red food color so they're pink and make them into heart shapes .... it's a super fun and yummy tradition, actually doing that this morning : ) happy valentine's day! So cute! What a great helper you had! AWW, so cute! Looks he had lots of fun and enjoyed the fruits of his hard work too!